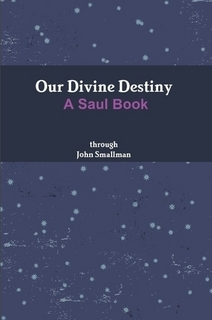 “Our Divine Destiny A Saul Book ” was originally published in 2011, and is now available at a 25% discount for $14.21 at www.lulu.com. For your copy CLICK HERE. Much has indeed been happening. Your world leaders find themselves in rather a quandary as their popular support dwin­dles, both among the general population and in their councils and cabinets. Many people are feeling betrayed as it becomes apparent how badly they have misled you. Trust in the political process is waning rapidly, and the desire for change and for political and governmental integrity and honesty is creating a groundswell of discontent that is leading towards great change and upheaval in your social structures. A majority of the world’s population, for the first time in recorded history, believe that war and violence are no longer options for solving disagreements of any kind, and that feeling is found in all levels of society. Those who make their living in combative spheres of activity are becom­ing severely disillus-ioned, and those who would lead and con­trol them are losing the ability to do so. Your leaders are being inundated with unconditional love and, as it sweeps over them and immerses them, they find themselves in the grip of personal crises as they begin to see their very selfish agendas in a new light. This change in perception is most alarming for them. They are well aware that it is a perception shared by millions, but it is one they have dismissed as impractical and weak-minded as they jockeyed very competitively for positions of power and influence on the world stage. Now their doubts about the agendas they have been pursuing so forcefully and enthusiastically are erupting into their awareness, and they find themselves no longer able to suppress or dismiss them as had been their customary way of dealing with them. It is a shocking experience — one that they had never before come up against — and it is leaving them dazed and perplexed. There is no one with whom any of them can acknowledge it, let alone safely discuss it, and this causes substantial anxiety. Some are close to panic, which is not an emotion to which they are accustomed. It does not sit well with their normal mode of operation, namely, to divide, manipulate, and control. It is an emotion they are accust­omed to seeing and provoking in others, and to find it threat­ening to overcome them is distracting, disorienting, and indeed scary. As you have been informed by many sources of the Light, major changes are about to occur at every level of human society. They have been divinely planned and orchestrated for eons of Earth time, and are now about to bear fruit. The results of these changes will be quite awesome, as people from all walks of life and every area of the world unite in a spirit of loving and harmonious cooperation to bring peace, healing, acceptance, forgiveness, and abundance to all on Planet Earth. The speed and efficacy with which these changes take effect will amaze and delight you all, and the realization that a peaceful, joyful, and harmonious existence for all on the planet is not only possible but is occurring, will be the final completion of a dream that you have been hoping for, desiring, and intending for so long. Celebration and joy are in the air, and as it comes into being, all sense or expression of fear, anxiety, anger, helplessness, and oppression will dissolve. Even your panic-stricken leaders will be filled with a sense of relief and happiness as it becomes apparent to them that their defenses — psychological and physical — are complet­ely unnecessary, and that they too can enter into the celebrations with total freedom from inhibitions or concerns of any kind. Gaiety and laughter will sweep through your lives. The arrival of this most awesome moment is almost upon you. Just hold the Light and hold the intent! Life, as you know it on Planet Earth, is moving rapidly towards a time of great change — great change in the way that you live, and in the way that you experience life as humans. As far back as your historical records go, and way beyond that, life has been a demanding experience with much confrontation between individuals, families, tribes, and nations, leading to much suffering and very many violent deaths. However, during the past fifty years there has been an enormous change in attitude concerning the rights and dignity of individuals and their place in society and in the world. Those who hold power over nations are no longer held in reverence and unquestioning respect, as they are increasingly called to account for their motives and behavior. Increasing awareness of the deceptions perpetrated by so many of your elected leaders, largely due to the greatly improved systems of communication available worldwide, has led to a very strong desire and intent to change the system, so that all will be treated fairly and compassionately. This desire and intent has led many to seek spiritual know­ledge, and to seek guidance and assistance from those in the spiritual realms — who they know exist abundantly — and who have an intense and loving desire to help when asked to do so. The prayers and meditations of so much of humanity during the last fifty years — intending that love and compassion, peace, healing, and harmony be poured down in abundance on Planet Earth to replace the anger, fear, jealousy, and hate that have been so prevalent for so long — have been welcomed with great joy in the spiritual realms. It is seen as a strong and most definite indication that mankind is at last awakening — and awakening to accept in joy and delight the divine abundance that God intends all to experience permanently. The abundance is there — available— awaiting your accep­t-ance of it. It really is as simple as that. Stop trying to work things out through the restricted reasoning of your logical linear minds. Open your hearts in acceptance of the divine energies that are poised, waiting to flow into and through you, lifting you up into full-conscious awareness of who you are and what your place and purpose is in the Creator’s magnificent plan for His most dearly loved creation. Every single one of you is totally blessed and totally loved by God, the supreme Being and Creator. So stop judging and fearing yourselves and others. Instead, open your hearts and allow the divine energy to permeate every aspect of your being. This will raise you up to a level of existence from which you will be able to see and delight in the wonder of this almighty loving creation, of which each one of you is a vital and essential part. Each one of you — each one that has existed, exists, or will exist — is part of the divine abundance of creation that God has brought into being for His own joy and for the infinite joy of each one of you. So open your hearts, receive His Love. Allow yourselves to be booster stations on the divine Love Grid, as His energy pours into you and through you to all of creation in an integrated flow of pure harmonious joy and abundance in every moment of existence. Open up, allow, release your resistance to the divine energy flow, and experience existence as God has always intended you to, with infinite joy, wonder, and bliss in every moment — always and forever. Right now, much is happening in the heavenly realms that would astound you. It is truly a case of “party time”! Humanity’s move into full consciousness is almost upon you, and we are in a state of joy as we watch this momentous divine event approaching. The planetwide prayer and meditation holding that intent is continuous and increasing in power. At every moment groups and individuals all over your beloved planet are praying and meditating for peace, harmony, and abundance. Those prayers are being received with great joy by our Creator. He loves you all infinitely, and He will shortly deliver – as requested. Because of your state of free will, a large number of you have been required to hold the intent and pray for this moment with all the power and intensity possible. Vast numbers of humans have yet to awaken, but deep within themselves they desire and intend to do so. Therefore, practically all of humanity desires, intends, and wills most powerfully to reawaken into full consciousness – your natural state of exist-ence. Over the eons, this desire has been growing, spreading, and intensifying as all humans have allowed this most wonderful divine seed to be planted within them. As more of you have awakened to the desire for peace, harmony, and unconditional love, you have nurtured these seeds and encouraged them to grow and develop within you. At first the growth was slow and steady to allow a strong base, foundation, or root system to develop, in order to support the most magnificent blossoming of unconditional love throughout humanity. The foundations are now most firmly established, and the most beautiful flowering is about to burst forth in a brilliant and glorious display. These flowers are perpetual and ever-lasting, and they will continue to flourish and develop into ever more glorious versions of themselves for their own radiant pleasure. In doing this they delight our Creator by being exactly and precisely what they are. And all of creation shares in that joy, which will grow unceasingly, intensifying every moment of joy as it occurs. And it is all about to occur! So intensify your prayers and meditation. Allow the divine abundance to suffuse you utterly, and come alive in this most amazing and inspiring Golden Age of coming together in peace, harmony, and bliss – which God’s infinite, unconditional Love provides. The Earth changes that are occurring now, and that are planned for the immediate future, are of a momentous nature, and most of humanity will be amazed and astonished when they become aware of what is happening to their beloved planet and to all of the life systems that she has been supporting so hospitably for so long. The surprise will change to wonder as the full impli­cations of what is happening becomes generally known and understood by those who choose to be aware. There are indeed many who still resist the loving energies of change and growth that are pouring down to awaken humanity’s spirit­uality, and to envelop each soul in a rapture of happiness and bliss. If they continue to resist and refuse to awaken into the new Golden Age that has been prepared for them, they will be free to move (and greatly assist-ed in that choice) to an environment with which they can reson-ate more comfortably. No one will be punished or discarded, and you should not judge or condemn those who choose not to partake in the new reality of abundance and love. Each has free will and the abso-lute right to move at his own pace along the homeward path to unity with the Divine. To attempt to force the pace of those who wish to travel more slowly would be a violation of their God-given rights, and would demonstrate a sorry lack of integrity and wisdom. All are “saved”; and all will return to the One when they are ready. And they will then be welcomed with the greatest of joy and love. The enlightened among you, who are choosing to move for-ward at this time, need not concern yourselves with those who choose a different “reality” even if they are at present closely and intimately involved in your life. You will soon under­stand how beautifully the divine plan has been constructed, allowing for no disappointments or broken promises. On the deepest levels, everything – absolutely everything – is on target and on schedule. And for those who choose to parti-cipate (and for many who to you do not appear to be ready but who will indeed awaken in good time to do so), complete bliss and ecstasy will shortly envelop you as the grand celebrations commence. Your reward is abundantly at hand. Your tremendous faith and devotion have brought you successfully to the threshold of this abundant, new and Golden Age. . . . And you are about to enter. As you wait, much is happening to finalize the preparations for humanity’s move into full consciousness. Your prayers, relax­ation, and meditation are most important, so do not neglect them. As you wait, be aware that all of us in the spiritual realms are also very involved in bringing this magnificent event to frui­tion. All have their part to play. Very soon now, all will be fully conscious. Have no doubts, because you are very close to the moment of change. We can feel its approach and are in a state of most eager anticipation. Fun, delight, and joy will envelop you, as life as you know and exper-ience it at present changes direction to bring you into full con-sciousness. Understanding, harmony, peace, and love will pour into your awareness as you watch the unfolding of the Creator’s divine plan into its next stage. Your happiness will be complete as you recognize and experience your unbreakable connection to the divine One, God, our heavenly Father. As you wait, accept. . . . Accept His creation as you presently experience it as humans on Planet Earth. Release all judg­ment, of others, of the planet, and of God. Trust His divine Intention and join with Him in making the intention: “Thy Will be done.” It is a very powerful and stabilizing prayer, which is always needed, and particularly at the moment of change, which is approaching very rapidly. Accept and acknowledge everything you are feeling and exper­iencing – without judgment, without fear or anxiety, and allow yourself. . . yes, allow yourself to accept full consciousness instan­tly and wholeheartedly at the moment of change. In so doing, you will move into that new divine state of being with skill and competence, ready to continue on your newly defined path, which will be instantly recognizable. Suddenly, as all becomes clear, you will find yourself doing in every moment precisely what is divinely appropriate, with great joy and ease, as you meet, mix, and mingle with all the old friends and relatives whom you have always loved, and from whom you have apparently been separated for so long. As I have so often told you before, it will be time of utmost joy, and it is almost upon you. The waiting time is practically over, and soon all will be revealed as the great divine event awakens you into full and wonderful consciousness of God’s plan for His creation, overwhelming you with delight. I have been taking dictation from my friend Saul since 1995. Prior to that I had for some years been reading many channeled books, and had found them inspiring and uplifting. I wondered “Could I perhaps channel a loving spiritual entity?” Then one day in 1995 I sat down, pen in hand, and asked “Please may I make contact now with a guide of high spiritual development to help me with my spiritual growth and life purpose, and any-thing else that would be beneficial to God’s Will for humanity?” I got an immediate response! And that is how I started channeling Saul. He is a spiritual entity whose messages over the years have inspired and uplifted me, and the time has come to share those messages. May they inspire all who read them. Thank you for your so beautiful messages, I have translated some in french. Est-ce qu’on peut le trouver en Français ? Non, je suis désolé, mais le livre n’a pas été traduit en français. As mensagens de Saul falam direto ao meu coração. e tem respondido minhas perguntas. Sou muito grata por suas mensagens. Hi John, I have been following your blogs for over a year now. They resonate with me. Thank you for sharing your work! Is there a book available for the “Jesus through John” posts? I have ordered your Saul book and look forward to reading it. Cheers and thank you!…sincerely, Harry in Canada.